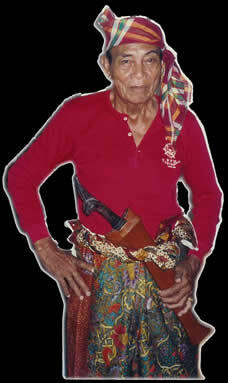 Ilustrisimo Kali (also Kalis Ilustrisimo) is a blade-based Filipino Martial Art founded by Antonio "Tatang" Ilustrisimo. The style has been in the Ilustrisimo family for over five generations and is based on traditional Filipino stick and sword styles. Antonio “Tatang” Ilustrisimo has fought in more “death matches” than perhaps any other FMA master, and has had his share of real life violent encounters. He killed his first man in self-defense at the age of fifteen while living in Jolo, a Muslim city in Mindanao, Philippines. During World War II, Ilustrisimo was a guerrilla fighter in the Sierra Madre Mountains of Luzon, and used his knife and bolo techniques in many close-quarter encounters with Japanese soldiers. Much later in civilian life, Ilustrisimo was arrested seventeen times for violent incidents in the mean streets of Manila. As a side note, Tatang was one of a few Grandmasters who carried an “anting-anting" (amulet) and had an “orasyon” (prayer) tattooed across his chest, and used these to invoke divine intervention in whatever life-and-death situation he was facing. Born in Bagong, Bantayan, Cebu in 1904. As a boy he studied eskrima from his father. At the age of nine he decided to travel to the United States, and stowed away on a boat he thought was headed for America. In actuality, he arrived in Mindanao, in the southern Philippine islands. 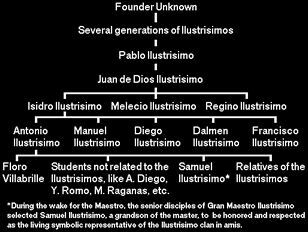 The Ilustrisimo clan has a long history as warriors and "men of power" (mystics or medicine men) that continues unbroken to this day. Grandmaster Antonio Ilustrisimo was the head of the style. The previous head was his uncle, the great Melecio Ilustrisimo, who was famous and dominant in northern Cebu (north coast, Bantayan and Bohol islands) in the early 20th Century. Another famous relative was the great mystic Agapito Ilustrisimo (his great uncle), who was active as a fighter in the revolutionary Katipunan. Antonio Ilustrisimo was one of the most well respected eskrimadors of the Philippines; He is famed for winning countless duels and street encounters, as well as serving as a guerrilla against the invading Japanese forces during World War II. Ilustrisimo was never defeated in combat, and earnt great respect as a result of his brave exploits against the Japanese. In 1976 Antonio Ilustrisimo accepted his first students Antonio Diego and Epifanio Yuli Romo. After Tatang's passing in 1997, Tony Diego was elected head of Kali Ilustrisimo. Other notable students include: Rey Galang, Romy Macapagal, Roberto Morales, Christopher Ricketts, Pedring Romo, Norman Suanico and Edgar Sulite.